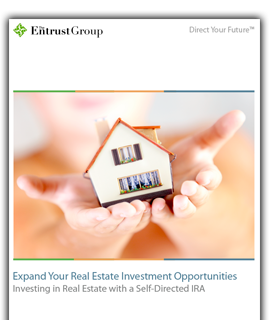 How do I Fund my Real Estate IRA Purchase? A direct investment involves purchasing a physical property and collecting the income generated within your self-directed retirement account. It is the simplest and quickest way to use liquid assets in your retirement account. Your IRA pays cash for the investment property and holds title to the property. Rules about prohibited transactions apply to direct real estate investments. Please make sure you understand these rules to avoid potentially significant tax penalties. Read about Real Estate Prohibited Transactions. Your IRA borrows money to purchase a property with a non-recourse loan and the leveraged property is held in your IRA. This sort of credit cannot be obtained by going through traditional means. Entrust works with many non-recourse lenders. A limited liability company, or LLC, is an entity often formed and used to purchase real estate in an individual’s IRA using IRA assets as a funding source. The IRA holds an interest in an LLC. The title of the property is held in the name of the LLC. Are there restrictions on the type of property I can purchase? Am I restricted to residential properties? Can I use the property during the year?